Wales are above England in the Fifa rankings for the first time as they prepare for Thursday’s Euro 2016 qualifier against Cyprus in Nicosia. Chris Coleman’s team held on to ninth – their highest-ever position – while England fell two places to 10th. Beating Cyprus would leave Wales within one win of qualifying for next year’s European Championship in France. 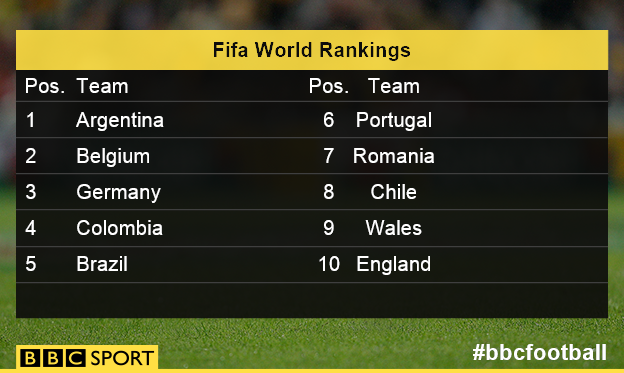 Wales boss Coleman said the rankings would be a “confidence boost” but said success was reaching Euro 2016. Scotland have risen one place to 31st while Northern Ireland (41st) and Republic of Ireland (51st) have both fallen one position. Wales and England are both above European champions Spain (11th) and Netherlands (12th) in a list topped by Argentina. 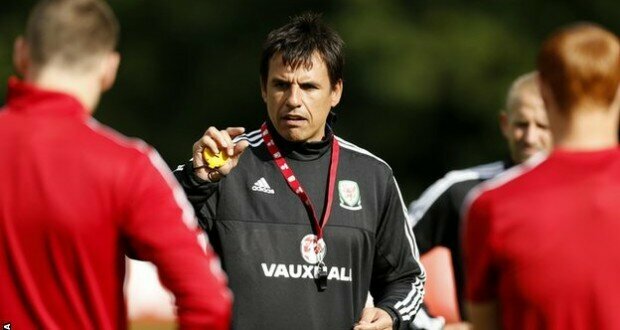 Coleman said: “We’ve been low in the rankings and had that rubbed in our face many a time. “Now we’re doing very well, certain people want to say the rankings are this and they’re that, but the players deserve it. In June, Wales climbed into the top 10 for the first time since the rankings were introduced in 1993. They are three points clear at the top of Group B with four games remaining as they attempt to reach their first major finals since 1958. Wales will qualify if they beat both Cyprus and Israel, whom they host on Sunday. England, who are top of their Euro 2016 qualifying group with a 100% record, face San Marino on Saturday. A team’s total number of ranking points over a four-year period is determined by adding the average number of points gained from matches during the past 12 months and the average number of points gained from matches older than 12 months. Points are determined by a formula based on the match result, the importance of the match, the strength of the opposition and the strength of the confederation.